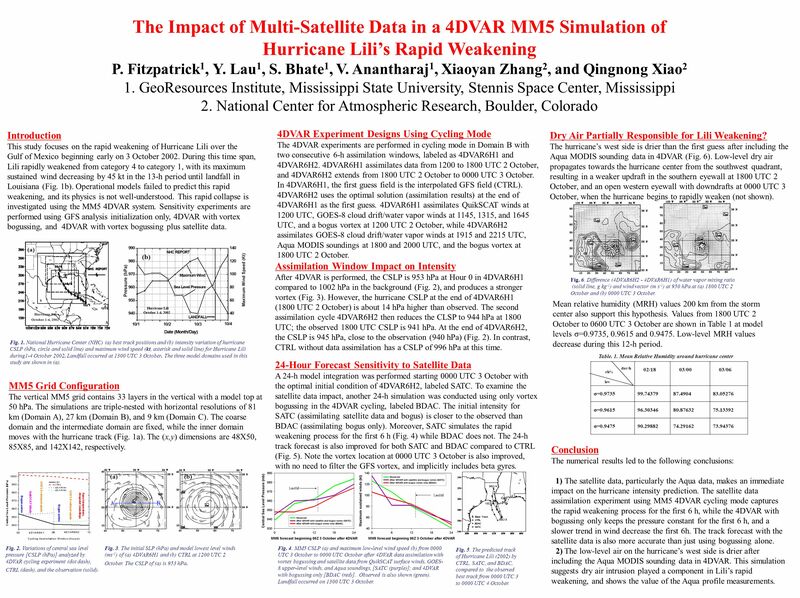 Download ppt "The Impact of Multi-Satellite Data in a 4DVAR MM5 Simulation of Hurricane Lilis Rapid Weakening P. Fitzpatrick 1, Y. Lau 1, S. Bhate 1, V. Anantharaj 1,"
Assimilation of T-TREC-retrieved wind data with WRF 3DVAR for the short-Term forecasting of Typhoon Meranti (2010) at landfall Xin Li 1, Yuan Wang 1, Jie. HWRF/GSI System Setup Abstract a Comparison of forecast tracks for CNT and WCNT. Summary and Future Plan Tong Zhu and Sid. The development of GRAPES_RAFS and its applications Xu Zhifang Hao Min Zhu Lijuan Gong Jiangdong Chen Dehui National Meteorological Center, CMA Wan Qilin. Critical issues of ensemble data assimilation in application to GOES-R risk reduction program D. Zupanski 1, M. Zupanski 1, M. DeMaria 2, and L. Grasso. 1 Use and Abuse of MM5 Chris Davis NCAR (MMM/RAP) Acknowledgements: Fei Chen, Kevin Manning, Simon Low-Nam, Jimy Dudhia, Jim Bresch, Wei Wang Presented. Introduction to data assimilation in meteorology Pierre Brousseau, Ludovic Auger ATMO 08,Alghero, september 2008. Generation mechanism of strong winds in the left-rear quadrant of Typhoon MA-ON (2004) during its passage over the southern Kanto district, eastern Japan. Impact of environmental moisture on intensification of Hurricane Earl (2010) Longtao Wu, Hui Su, and Robert Fovell HS3 Science Meeting May 2014. A drag parameterization for extreme wind speeds that leads to improved hurricane simulations Gerrit Burgers Niels Zweers Vladimir Makin Hans de Vries EMS. Jeopardy Composition of Hurricanes Locating Storms Type of Storms Hurricane Categories Organizations Q $100 Q $200 Q $300 Q $400 Q $500 Q $100 Q $200. The Utility of GOES-R and LEO Soundings for Hurricane Data Assimilation and Forecasting Jun Timothy J. Schmit #, Hui Liu &, Jinlong and Jing. Cold Fronts and their relationship to density currents: A case study and idealised modelling experiments Victoria Sinclair University of HelsinkI David. Reason for the failure of the simulation of heavy rainfall during X-BAIU-01 - Importance of a vertical profile of water vapor for numerical simulations. Danielle M. Kozlowski NASA USRP Intern. Background Motivation Forecasting convective weather is a challenge for operational forecasters Current numerical. 5/22/201563rd Interdepartmental Hurricane Conference, March 2-5, 2009, St. Petersburg, FL Experiments of Hurricane Initialization with Airborne Doppler.